Greetings, New Mexico craft beer lovers. Stoutmeister here with the reunified edition of The Week Ahead in Beer. This column covers all the breweries in Bernalillo and Sandoval counties, with Santa Fe’s four breweries and one newcomer down in Socorro also joining the party. We tried hard to keep the state edition going, but without participation from the breweries outside the I-25 corridor, it was futile. Another holiday weekend is upon us, which means lots and lots of things are going on. Take note that a few places are going to close early Saturday, such as Bosque San Mateo and Nexus at 5 p.m. So get those growlers filled early and then head off to watch the fireworks. If any other breweries decide to close early, we will do our best to update you all via social media this weekend. Beyond that, in case you missed our post Wednesday afternoon, Bosque is having a release party for Scale Tipper on tap and in bombers tonight (Thursday) from 6 to 9 p.m. at their Nob Hill Public House. Pork & Brew is kicking off in Rio Rancho on Friday with Cazuela’s, Kaktus, Red Door, and Turtle Mountain all participating. We hope to have some beer lineups posted soon when they are made available. The event runs through Sunday and we had a little preview posted earlier in June if you need more info. Then, to cap the weekend, how about the VIPA Challenge? The preliminary round of the annual three-stage event will feature 25 IPA samples that must be whittled down to 14. We will have an extended preview posted later today with all the details you need. Tickets (a.k.a. Enthusiast Memberships) are still available online! Meanwhile, there are a few new beers around town this week. Albuquerque Brewing has added Golden Oak, with 3222 Wheat and Southside Pale Ale due up any day now. Chama River has harnessed the power of Schwarzbier. La Cumbre will tap their State Fair Cream Ale today. Marble has brought back the popular 111 Farmhouse. Ponderosa has a slew of new beers including Bellamah Brown, American Wheat, and Raspberry Gose. Tractor’s Berliner Weisse is back for another summer run. Up in Santa Fe, Blue Corn has Orogrande on tap now and any day will be putting their IPA Challenge entry on tap as well. Duel goes big again with Cezanne Magnifique, a barrel-aged imperial saison. Santa Fe tapped Simcoe Pale Ale. Second Street has a fresh batch of Latona Amber. Up in Los Alamos, Bathtub Row has floated the new Posh IPA and Hoppenheimer IPA (which might win our beer name of the year award). Continue reading for all the news that is fit to blog for the week of June 29. 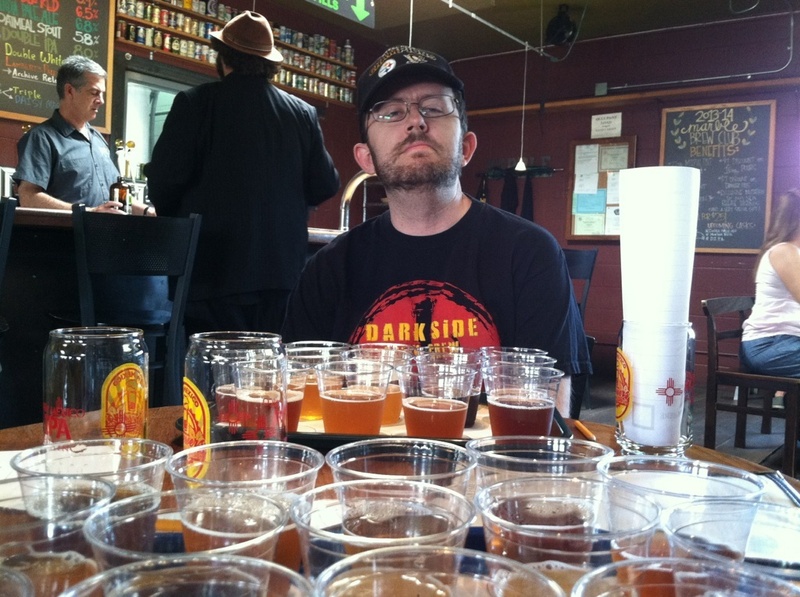 Beers: SuMariOatmeal Stout, Possessive IPA, 505 Bananas (Saison), Golden Oak. Located at 8620 Pan American Blvd., on the east side of I-25 and between Paseo del Norte and Alameda, ABC is now open and ready for business. In addition to the house beers, there are often guest taps, plus the plan is to have at least one beer on a nitro tap at all times. For more info on ABC, you can check out my advance preview. The new Golden Oak is the regular IPA that has been barrel-aged for a unique twist. The 505 Bananas is a saison with an obvious flavor kick, but let it warm up and you will taste the pepper hints. Brewer Mike Marsh said he is still tinkering with that one as it is using a new yeast strain. The SMO Stout can be enjoyed in summer or winter. Beers: Dunkel Weizen. The Dunkel Weizen went on tap last week. BG goes through their beers fast, so hurry out to try it. If you have not made it out there yet, the Grasshopper is located at 4500 Arrowhead Ridge Road in Rio Rancho, just off Highway 528. Beers: EKG Pale Ale, The Last Straw, Old Man Jameson, Summer in Hallertau, Scotia on nitro, Scale Tipper IPA (all locations by Friday), Cirrus DIPA (San Mateo and Nob Hill), Bosque Pale Lager (Las Cruces only). All beers listed are on tap at all three locations, unless noted. Scale Tipper will return with a release party tonight (Thursday) at Nob Hill. It will then be tapped at the other two locations Friday. Bombers of Scale Tipper will be on sale at all three locations. Before that, the most recent addition was Cirrus DIPA (8% ABV, 100 IBU), a beautifully burly hop bomb that kicks off the Monsoon IPA series for the summer. Look for three more specialty IPAs in the weeks to come. If you need less hops, try the Summer in Hallertau (5.5% ABV, 20 IBU), a pale ale made with a slew of European noble hops. The Pale Lager (5.4% ABV, 45 IBU) was brewed as a traditional lager and then they went with dry hop additions of El Dorado, Centennial, Citra, and 7C’s during the whirlpool. Riverwalker IPA (6.5% ABV, 90 IBU) is now the permanent IPA on tap at all Bosque locations. The other seasonals are the EKG Pale (5% ABV, 25 IBU) and The Last Straw (5% ABV, 12 IBU), a hefeweizen. Welcome back to the Old Man Jameson (5.2% ABV, 18 IBU), a Scottish export ale. Scotia, Jameson’s big brother, is now on nitro at all three locations. Cask: From now on, Bosque will have their firkin filled every Wednesday, available only at Nob Hill. This week’s beer is EKG Pale Ale. Beers: (Regular) Paw Swipe Pale Ale, Hairy Mit Hefe, Standing 8 Stout, Ambear Ale, Uppercut IPA, Apple Bear Hard Cider; (Seasonal) Rye Mouth, Body Czech Bohemian Pilsner, K.O. Kolsch, Salute Your Schwarz, Wiener Munchner, Regal Squabble English IPA, Sucker Punch DIPA. The most recent addition to taps is Sucker Punch, a monstrous, piney, resinous DIPA checking in at 8.1-percent ABV and about 125 IBU. The newest before that were the Rye Mouth, K.O. Kolsch, Regal Squabble, and Wiener Munchner, another German-style beer as the name might imply. The Body Czech (4.3% ABV, 40 IBU) is a great way to start your flight. The Standing 8 Stout (6.3% ABV, 45 IBU), which is on tap at all times, claimed the 2015 Stout Challenge, held by the Crew before the last Super Bowl. Head on over to indulge in this beast of a beer. The Apple Bear Hard Cider (5% ABV) is now permanently on tap. Beers: Irish Red, Hefeweizen, Dark American Lager, Saison, Big Red Fez, Hops-pitality IPA, Hoppyweizer, Marzen, Raspberry Lime Wheat. An old favorite, the Marzen (5.6% ABV, 22 IBU), is back, and the new Raspberry Lime Wheat (4% ABV, 12 IBU) is selling fast, so go get some if you like the style. The Hoppyweizer (6.1% ABV, 40 IBU) is a hopped-up wheat beer created in collaboration with the team at ABQBeer.com. Other recent additions are the Saison (5.5% ABV, 24 IBU) and Big Red Fez (7.6% ABV, 22 IBU), a rich, malty Belgian Red Ale. The Hefeweizen (6.2% ABV, 14 IBU) is a good example of the classic style. Hops-pitality (7.3% ABV, 80 IBU) was brewed for Beer Week, so it might not last much longer. Beers: Magic Mullet Cream Ale, Schwarzbier, Chamahawk Xtra Pale Ale, Sage Saison. Magic Mullet (5.7% ABV, 18 IBU) is another example of a great summer-style beer. The Schwarzbier replaced the Red River Ale this week. The Sage Saison (6% ABV, 20 IBU) is the latest entry in the summer of saison at Chama. Beers: Helles, Bier De Garde, ESB, Amber, Aye Aye IPA, Black Beauty Stout, London Porter, Jaison, Sweet and Dry Apple Cider. The most recent addition is Aye Aye, which owner Dana Koller described as the biggest IPA that Kaktus has ever brewed and one they will enter in the IPA Challenge. The Jaison is a special saison, offering up a tangy, spicy medley of flavor. The Black Beauty is a sweet, creamy stout that is not too thick for the warming weather (well, we assume the weather is going to warm up here at some point). Kaktus is located at 471 South Hill Road in Bernalillo, for those who have still not made the trek. Beers: Saison D’Hommel, Hop-Back Centennial Pale Ale, Acclimated DIPA, Fievre d’Abricot, State Fair Cream Ale. Just in time for the heat, the refreshing Fievre d’Abricot is back on tap. New to taps starting today (Thursday) is the State Fair Cream Ale. Also, for all of you hopheads, the Acclimated is back. It is Elevated’s bigger, hoppier brother. Another recent addition is an old favorite in Saison D’Hommel. The Hop-Back Centennial is the first in a planned series of Hop-Back pale ales, assuming Jeff can get his hands on lots of whole leaf hops. Oh, and don’t panic about Project Dank and Red Ryeot no longer appearing here as seasonals. They are now part of La Cumbre’s regular lineup. Red Ryeot cans are now for sale around town and at the brewery. Events: There is no live music this Saturday due to the holiday. Beers: Both locations — Dang Pale Ale, Weizenbock, Imperial Red; Downtown only — DIPA, 111 Farmhouse; Westside only — White Out. We now have a breakdown of which seasonals are available at both Marble locations, Downtown and Westside. The popular 111 Farmhouse (7.2% ABV) is back for another summer run. The Dang PA (5.2% ABV) was made with wildflower honey and Curacao orange peel. The Weizenbock (7% ABV) fits the season nicely. The White Out (9% ABV, 40 IBU), Marble’s seventh anniversary ale, is also available in bombers. In live music this week at the downtown pub, Cranford Hollow performs tonight (Thursday) from 7 to 10 p.m. Ziatron performs Friday from 8 to 11 p.m. The Saturday show this week is an early one as Zoltan Orkestar performs from 2 to 5 p.m.
Funk Tractor performs Friday from 6 to 9 at the Westside Taproom. They will be followed by Eryn Bent from 6 to 9 on Saturday. Beers: (Regular) Ghost Train IPA, Rip Saw Red, Crosscut Kolsch; (Seasonal) Midnight Kolsch, Rauchweizen, Stage 1 IPA, Collaboration Cream, Bellamah Brown, American Wheat, Raspberry Gose. Ponderosa is located at 1761 Bellamah NW, which is just east of Rio Grande and due north of the NM Natural History Museum, in the bottom floor of a swanky-looking apartment/retail complex (they have a sign atop the building now that you cannot miss). There was a big tap turnover this week at Ponderosa. Gone are the Brunch Stout, Zwickel Pils, Phantom Conductor II, Rosa’s Gose, and Bavarian Belle. The good news is there are three newcomers and one returnee in the lineup. Back for a second run is the Collaboration Cream (4.5% ABV, 25 IBU), which was made with help from the staff at Anodyne. New are the Bellamah Brown (5% ABV, 30 IBU), American Wheat (5.2% ABV, 16 IBU), and Raspberry Gose (5.5% ABV, 15 IBU). The Midnight Kolsch (4.3% ABV, 24 IBU) looks like a dark lager but still tastes like a sweet, light kolsch. The smoky Rauchweizen (5.3% ABV, 17 IBU) earned high grades from folks when it debuted during ABQ Beer Week. Events: There is no live music listed this week. Live music is back this week with The Real Matt Jones tonight (Thursday) from 7 to 9 p.m., followed by Felix y Los Gatos on Monday from 7 to 9. Beers: C+C IPA, Farmhouse Saison, Barley Wine, Tupac Cali Red, Half-Acre Hefe, Berliner Weisse, Dry Apple Cider, Pear Cider, Berry Cider, Sour Cherry Cider, Goat Head Hador Doppelbock (Nob Hill only). Berliner Weisse (5.1% ABV) is back at both locations. Half-Acre Hefe (6.2% ABV, 10 IBU) has also returned just in time for summer. The popular Tupac Cali Red (6% ABV) is also back for a second run. Another recent addition is the Saison (7% ABV, 25 IBU), an old world-style beer brewed with lemon and orange peel. The 2015 edition of the Barley Wine (9.5% ABV, 65 IBU) is a giant malt monster, not too boozy but just enough to remind you that a few of these will leave you babbling alone in the corner. And if you have friends who are living the gluten-free life, you can take them with you to Tractor and let them choose between five ciders, the standard Apple Hard Cider and four new seasonals in the Dry Apple, Pear, Berry, and Sour Cherry. Events: The Thirsty Thursday Music Series is back at Wells Park as Nick Pena performs at 8 p.m.
Saturday at Wells Park, DJ Clout will spin for the In the Mix Series at 9 p.m.
Tuesday will feature the return of Music For What ALES You with Casey Mraz at 8 p.m.
Also, every first Monday of the month at both Tractor locations is Beer for a Better Burque night. For every pint you buy $1 can go to one of four charities that have partnered with Tractor. You can also opt to purchase a special growler with the logo of your favorite charity. So yes, that is this Monday. Beers: (House) McDay’s Cream Ale, Oku Amber, Parasol White IPA, Hopshell IPA, Heidelberg Helles, Stauffenberg Stout. (Seasonal/specialty) Kellerbock, Brohemian Pilsner, The B Word (ESB), Manneken Pale Ale. To help us out for now and the future, brewer Tim Woodward broke down what will be the regular beers on tap (under House) and the current list of seasonals. That’s a pretty solid regular lineup. I personally really enjoyed the new Stauffenberg Stout (it replaced the Piedra Lisa Porter in the regular lineup) and Amber, the latter of which trumps most of its genre in terms of flavor. The Heidelberg Helles (5.1% ABV, 25 IBU) has rejoined the regular lineup for good, or so Tim hopes. The most recent addition is the Kellerbock, which replaces the Adrift IPA. The B Word, an ESB, and Manneken Pale Ale, a Belgian-style, are other recent additions. Beers: Midnight Red, Bogged Down, Orogrande. The most recent addition is Orogrande (6% ABV), a golden ale. Midnight Red is a big old beast of an imperial red that is just a huge dose of happy. Bogged Down, a cranberry cream ale, is on tap for those who can’t take the big hops. News: Blue Corn brewer James Warren said next up are their entry in the upcoming IPA Challenge, which they made with 60 pounds of hops, and a Citra Pale Ale. Events: The next Thursday at the Brewer’s Table is July 9. They are aging Barley Wine in Apple Brandy Barrels provided by Santa Fe Spirits. We will have more on this event next week. Beers: Black IPA, Chicken Killer, Highland Heath, Santa Fe Session, Simcoe Pale Ale. The third entry in the ECS (Ever Changing Series) is now available on tap and in bombers in the form of Highland Heath, a barrel-aged Scottish ale that is just heavenly. Available in limited supply at the brewery are the Session and Simcoe PA. The Freestyle is now available on tap and in cans across the state. Beers: Kolsch, IPA, Cream Stout, Rod’s Steam Bitter, Railrunner Pale Ale, Golden Ale, Latona Amber. The Latona Amber is the newcomer this week. The Steam Bitter won a gold medal at the 2014 GABF. The Pivotal and Boneshaker Bitter are often available for purchase in four-packs of cans. Events: Live music is back this week at both locations. At the original location, the Thursday Patio Series kicks off tonight with Jaka. Cloacas plays Friday. Saturday will feature the Swing Soleil. Over at the Railyard location, Howl and Pine will take the stage Friday. The Gunsels will perform Saturday. Sunday will feature a Patio Series with Les Gens Bruyants. Beers: Little Bird Blonde, Posh IPA, Hoppenheimer IPA. Please welcome Bathtub Row to The Week Ahead in Beer! We are proud to have Los Alamos’ first brewery amid our listings. They currently have three house beers on tap and four guest taps, the latter of which they tend to cycle through pretty quickly. They also cycled through two house beers last week as the Wit Rock and Second Base Pale Ale were wiped out by thirsty folks. To replace them, the Posh IPA (5.9% ABV, 54 IBU) and awesomely-named Hoppenheimer IPA (7.3% ABV, 67 IBU) are now available. The Posh is a more traditional English-style IPA, while the Hoppenheimer figures to be an almost permanent addition to the lineup as Bathtub Row’s flagship IPA. Events: Bathtub Row hosts an Open Mic Night every Thursday at 6 p.m., except this week when Trainwreck Blues Band takes the stage.